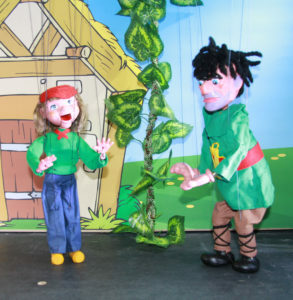 Ireland’s travelling marionette theatre, The Moon & Sixpence Puppet Theatre, present “Jacqueline & the Beanstalk” at the Phoenix Park visitors Centre. Marionette performances are at 2pm & 3:30pm on Bank Holiday Monday, 31st October 2016. Each performance lasts 45 minutes and admission is free. “Jacqueline and the Beanstalk” is a re-telling of the classic story that upturns the gender-stereotyping of traditional fairy tales! This marionette production also tackles the issue of bullying, showing how it can be overcome with the help of friends, and how bullies can change their ways when they realise the pain they cause. As with every Moon & Sixpence marionette production, this live show, performed live with music and sound effects, is filled with humour and audience interaction.